White Ribbon Alliance Malawi’s message of respectful care is catching on in districts across Malawi, showing a national hunger for fair and equal treatment for women and girls. Despite significant gains around the world, Malawi’s maternal mortality ratio is still very high, with 439 women per 100,000 dying in childbirth. White Ribbon Alliance Malawi’s focus on saving girls from early marriages and supporting the health and rights of mothers and their healthcare workers is reducing this unforgivable number of preventable deaths by helping individuals harness their collective power to change the status quo. WRA Malawi has empowered entire communities by providing evidence that their voices matter and can end child marriage, help girls finish school, and save lives by building a culture of respect based on the universal rights of childbearing women. WRA Malawi’s strength comes from its “Chapters” — which are rapidly expanding, in communities with some of the highest maternal mortality rates — and by the passion of countless WRA members and volunteers. It is through the dedication of this coalition of advocates that entire communities have been mobilized to tackle the issues most affecting their heath, leading to improvements across districts that have saved the lives of countless women and newborns. 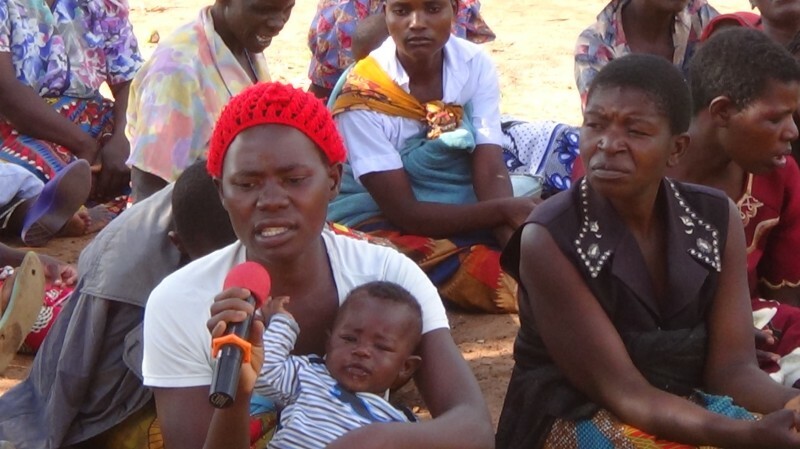 A mother speaks about her health and rights at a citizens hearing in Malawi. Photo: WRA Malawi. Before White Ribbon Alliance began working in Kasungu District, there were widespread reports of women being sexually harassed at health facilities by guards and “sexual cleansing ceremonies,” events in which young girls were put at risk of contracting sexually transmitted infections and early pregnancies. Outraged by this routine mistreatment of women and girls, the Wimbe WRA Malawi Chapter held a meeting with the women of the community that allowed them a safe space to voice their concerns, and, even more importantly, gave them the opportunity to work with community leaders to find a solution to these human rights violations. As a result of these public meetings, 10 teenage girls are back in school after their planned early marriages were cancelled, the “cleansing ceremony” has been abolished across the region, and women and girls, newly made aware of their rights, are actively voicing their demands for improved healthcare. And, because the community leaders were able to listen to the demands of women and girls in an open forum without blame, a new culture of openness has been created that allows for a collaborative process between citizens and the government to properly address maternal health needs. At the same time WRA Malawi was helping community leaders in Kasungu District understand the violation of human rights inherent in early marriage and “cleansing ceremonies,” they were also opening the eyes of traditional leaders on the importance of including women in the planning process of laws and policies that directly affected a woman’s well-being. In a seemingly positive move that ultimately proved misguided, traditional leaders had created by-laws that punished women for delivering at home instead of at the local health center by charging them a fine. Though the idea to have more women deliver in the care of qualified midwives stemmed from a good place, the fine for non-compliance ultimately proved to be a deterrent: women who went to the facility had to pay a fee to deliver, or they would have to pay a fine for delivering at home — no matter what, they were going to be charged and, with frequent reports of abuse at the facility, many women simply chose to stay at home. WRA Malawi’s community engagement efforts showed the traditional leaders that creating these by-laws without consulting the women they were hoping to help was having unintended consequences. If the women had been consulted before the by-laws had gone into place, leaders would have better understood women’s decision-making processes, and worked to improve the healthcare facility and the treatment provided in order to encourage women to deliver there instead of punishing them for not. With WRA Malawi’s encouragement, the fine was abolished, midwives have been trained to treat women with dignity through Respectful Maternity Care practices, and there have been no further reports of women delivering at home. White Ribbon Alliance has shined a light on the intolerable abuse women and girls were receiving in health facilities, and government leaders are starting to embrace Respectful Maternity Care as standard practice. When WRA Malawi held a citizens hearing in Dowa District last year, new mothers shared stories of disrespect and abuse they had received from their midwives while giving birth, and together, the community was able to identify two of the most abusive midwives working in government-sanctioned health facilities. It soon became clear that many women were choosing to deliver at home out of fear of being abused at the facility by the staff. Through the collective efforts of the entire community, WRA Malawi was able to ensure that the facility’s entire staff was trained on the importance of treating women and newborns with respect. And, to help regain the community’s trust, the troublesome midwives were transferred. The women in Dowa District now feel empowered and listened to, which has led to an increase in the number of women seeking maternal health services across the area. Understanding that midwives are often under stress at underfunded and understaffed health facilities, the focus on helping midwives is a major aspect of WRA Malawi’s work. They have been critical to the hiring of new, qualified midwives, and local Chapters have worked to improve the lives of midwifery staff by providing respectful maternity care trainings, identifying the lack of qualified staff across the country that has led to widespread burnout, and by giving mats and other materials to health facilities so that midwives have a way to rest between deliveries. WRA Malawi’s holistic approach of community organizing for improved quality reproductive healthcare is helping women, midwives, and entire communities understand each other and find common ground to save the lives of women, mothers and newborns. By helping political and cultural leaders interact directly with the people living in their communities, WRA Malawi has proven time and again that listening to women’s healthcare needs — and having women and girls sit at the decision-making table when policies and plans are being made that concern them — is the only way sustainable, lifesaving changes can be made. WRA Malawi’s recent successes and rapid expansion shows that the White Ribbon Alliance movement for improved reproductive and maternal healthcare is one the people of Malawi are ready to embrace.